The Sturm is one of the most powerful Exotic hand cannons in all of Destiny 2, going toe-to-toe with weapons like the Rat King. In this Destiny 2 Sturm Exotic guide, we'll be walking you through how to get Sturm in Destiny 2 as easily as possible. For more on Destiny 2 check out our Destiny 2 guide hub. It’s full of loads of useful info, including strike walkthroughs, general tips, and how to guides. In this guide to the Destiny 2 Sturm, we'll explain what Sturm is, give details on the steps needed to get your hands on Sturm, and provide tips so you can complete those stages. What is Sturm in Destiny 2? Sturm comes with many perks that make it a great weapon in Destiny 2. Due to a combat grip it is easier to stay focused on enemies, plus it has a great range and large ammo capacity. Sturm might not have the same level of interest as Rat King, but it's a fine weapon all the same. Accomplice - Kills with Sturm refill the ammo of your equipped Energy weapon. Extended Barrel - Increases Range, decreases handling speed. Extended Mag - Greatly increases magazine size, decreases reload speed. Storm and Stress - Kills with the sidearm Drang grant bonus precision damage until the next reload. Combat Grip - Sturm much less vertical recoil. Getting your hands on Destiny 2's Sturm isn’t a case of randomly being given it, as you might find with other Exotic weapons like Sweet Business or Riskrunner. To get Sturm you’ll have to get your hands dirty and complete a number of missions, so follow the step by step instructions in our how to get Sturm guide, and you'll have the sought-after weapon in your inventory in no time. Complete the main Destiny 2 story missions to unlock world quests. To get started on completing the story mode as quickly as possible, check out our Homecoming mission walkthrough guide. Head to Nessus and take the 'O Captain' world quest from Failsafe. To complete this, you'll need to find the audio logs of five crew members on Nessus, and then head to the waypoint that Ghost gives you to reach the satellite array. Now you're on to the 'My Captain' quest. This is a straightforward one, as all you need to do is complete a few platforming puzzles, and take out a number of Vex afterwards. Complete the My Captain quest to get the Drang sidearm and an item for Master Rahool, the Cryptarch in the Traveler social hub. Deliver the item (a piece of paper) to Rahool and you’ll be given the Relics of the Golden Age exotic quest. Complete the Relics of the Golden Age exotic quest and you’ll get the Sturm exotic hand cannon. Check out our guide just below on how to complete the Relics of the Golden Age quest. Kill 10 Fallen on Nessus using the Drang sidearm you acquired earlier on in the process. Return to Master Rahool and collect a message for Tyra Karn. Go to the Farm and speak to her to get the next quest objective. Achieve 10 Fallen multi-kills on Nessus with Drang. A multi-kill is achieved by killing two enemies without reloading your weapon. Kill 10 Fallen Majors on Nessus with Drang (You'll spot these as they have yellow health bars). Launch the Exodus Crash Strike and kill the servitor boss, Kendricks-7. Return to Tyra Karn and the Sturm Exotic in Destiny 2 is yours. If you'd rather watch a guide, the video below walks you through how to get Sturm in Destiny 2. 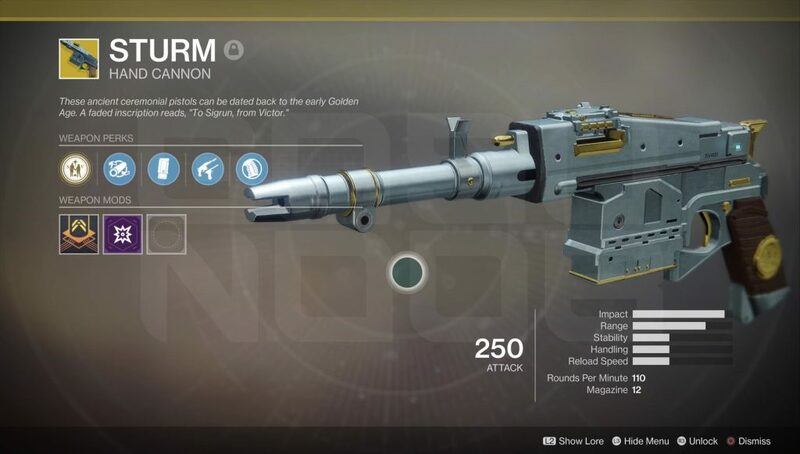 Sturm requires quite a bit of effort to get, particularly when you come to the quest given to you by Tyra Karn, so it's a safe bet to expect it to be one of the better Destiny 2 Exotic weapons. Sturm is a fantastic hand cannon in its own right, able to dole out damage with some of the best Energy weapons in the game, but keeping Drang around once you're through with this quest line definitely pays dividends. Sturm and Drang actually complement each other rather nicely, because of the perks that both weapons have. If you start out any activity with Drang, then switch to Sturm once you need to reload Drang, Sturm will actually have reloaded Drang by the time you need to switch back, provided of course that you get at least a single kill. This increases your bullet ouput hugely, as it cuts out needing to reload Drang. It's a nice combination, particularly if you're in any PvE activities like Strikes or Raids. Now Sturm is yours you might want to read how to get Rat king in Destiny 2 or how to get Mida Multi-Tool in Destiny 2.